Two days after Tim Walz turned 17, he and a military recruiter drove 30 miles to a farm field in northern Nebraska. A farmer, who was also a lieutenant in the Army National Guard, hopped down from the tractor he was using to till a field. "And we did the oath of enlistment right there on the edge of a field with the recruiter and that led me on a 24-year journey," Walz recounted recently as he reflected on what had been a family expectation of military service. 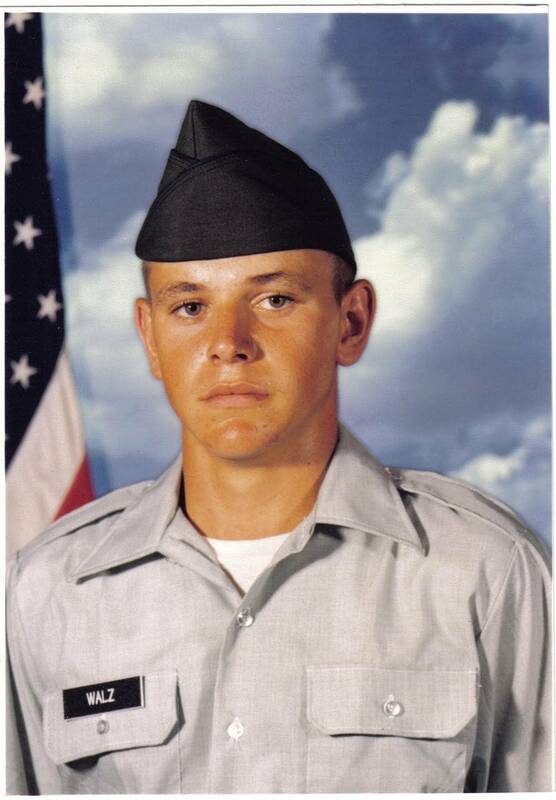 Not long after, Walz was off to basic training in Georgia. It was the first stop in a military career that would take him to Arkansas, Texas, the Arctic Circle and several outposts in between. "You go where you're told to go." Walz, 54, relished being a "citizen soldier, doing it and being part of the people that you defend." In his campaign for Minnesota governor and, by default, Guard commander in chief, Walz touches on his military days. Sometimes it's an icebreaker when the Democratic nominee encounters a fellow veteran in public. Other times, he references it to stress his leadership and motivational skills. About half of Minnesota's governors wore a military uniform prior to winning office, though neither of the past two had Armed Forces experience. Walz, who faces Republican Jeff Johnson on the November ballot, would be the 20th veteran elected governor, according to the political research site Smart Politics. "I'm certainly proud of my military service, but it's one piece of me. It doesn't define me," he said, adding of voters, "I certainly wouldn't ask them to elect me because of that alone." Walz was stationed in New Ulm, Minn., and part of Minnesota's National Guard when he retired in 2005, around the same time he began his first campaign for Congress, which he won the next year. During that race, Walz's service was a prominent feature, and also a source of a late-campaign dispute. Tom Hagen, a military reservist from Waseca, Minn., who served in Iraq, wrote a letter to a newspaper in the district saying that Walz wasn't being entirely candid about his record "through artful omission" about where his overseas missions took him. Hagen said voters deserved to know Walz didn't deploy to Iraq or Afghanistan. Walz didn't let it go unanswered and criticized Hagan as dishonoring a fellow veteran. "There's a code of honor among those who've served, and normally this type of partisan political attack only comes from one who's never worn a uniform," Walz wrote in the same newspaper, The Winona Daily News, just days before being elected. During his two decades, Walz was part of flood fights, responded to tornadoes and spent months on active duty deployed overseas. He specialized in heavy artillery and had ribbons for proficiency in sharpshooting and hand grenades, according to military records obtained through an open records request. Walz acknowledges he never saw combat. "I know that there are certainly folks that did far more than I did. I know that," Walz said. "I willingly say that I got far more out of the military than they got out of me, from the GI Bill to leadership opportunities to everything else." Walz did suffer health consequences from all those howitzer cannon booms. U.S. Department of Veterans Affairs records supplied by Walz after MPR News inquired about the scope and timing of the damage show he filed a claim for bilateral hearing loss and tinnitus with the agency in 2013. In a benefits application, Walz spoke of blasts that "would knock us down and after firing I had ringing in my ears" and hearing loss that progressively worsened during his 21 years in the field artillery unit. In late 2002, he was ordered to appear before a medical retention board about the hearing impairment. After waiting for a decision for months, he was given clearance to serve out the remaining years of his final six-year enlistment. Medical records show that in 2005 Walz underwent stapedectomy surgery, a procedure in which damaged bones inside the ear are replaced with a prosthesis. He said it has improved his hearing. By the time Walz left the military, he achieved the rank of command sergeant major, one of the top ranks for an enlisted soldier. Personnel file records show that he was reduced in rank months after retiring, leaving him as a master sergeant for benefits purposes. Capt. Holly Rockow, a public affairs officer for the Minnesota National Guard, said it is legitimate for Walz to say he served as a command sergeant major. She said the rank changed because Walz retired before completing coursework at the U.S. Army Sergeants Major Academy along with other requirements associated with his promotion. As command sergeant major, Walz holds the distinction as the highest-elected enlisted member ever to serve in Congress, a point of pride colleagues sometimes brought up at Capitol Hill hearings. Neither Walz nor his campaign lined up former military colleagues to speak on his behalf, saying anyone who comes forward does so on their own. MPR News located some independently. 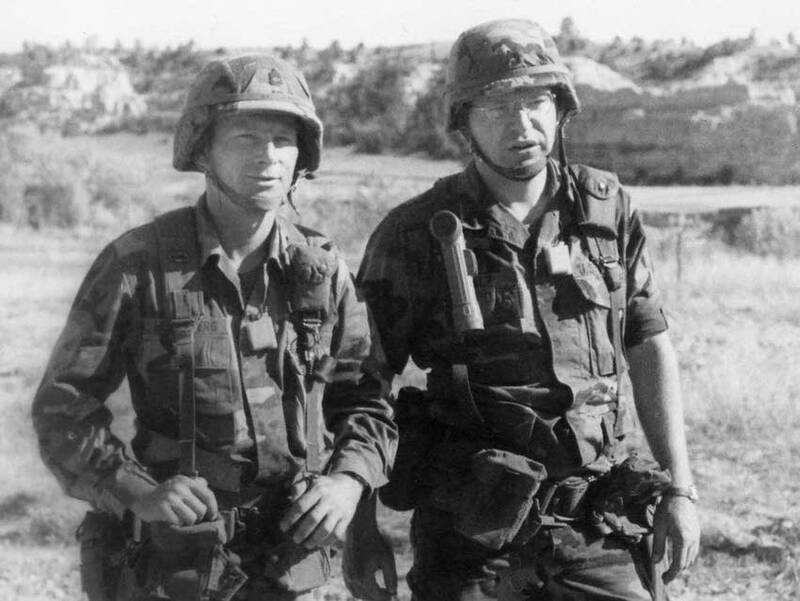 Jeff Bertrang outranked Walz in the unit and retired as a brigadier general. Now the New Ulm schools superintendent, Bertrang has a fond recollection of Sgt. Walz. "His willingness to learn and to inspire others, he had a go-get-em' attitude," Bertrang said. "It wasn't sit back and wait to see what happens." They spent time stationed together in the far reaches of Norway, where Guard troops trained with NATO allies, doing drills in the snow in 30-below-zero temperatures. Bertrang said Walz was good at putting his colleagues at ease and demonstrated an appreciation for varying viewpoints and differing backgrounds, all of which could transfer to politics. "You have to understand how to get along, how to work together, how it's not always one way or the highway, come to mutual understanding," Bertrang said. "Having that type of capability and experience goes a long way in leading whatever organization it's going to be." Bertrang said he hasn't spoken with Walz in a year. Al Bonnifield served under Walz, as did his younger brother. Bonnifield vividly recalls the first time he saw his new sergeant upon returning from annual training. "He was down at the motorpool barking orders at everyone," Bonnifield said. Bonnifield said he and his squad mates weren't sure what to make of him. "We all kind of looked at him kind of funny like, 'Who is this guy?'" Bonnifield said. "But after a while we all got to know him and respect him very much." They worked together in the armory base supply shop. He knew Walz as a guy who would play practical jokes on fellow soldiers and who would chat up anyone, regardless of differences in rank. Bonnifield said they also bonded during a deployment to Italy connected to post-Sept. 11 Operation Enduring Freedom. After seven months abroad, the unit returned to Minnesota. But Walz had already begun thinking about an exit and bounced it off others, including Bonnifield. "Would the soldier look down on him because he didn't go with us? Would the common soldier say, 'Hey, he didn't go with us, he's trying to skip out on a deployment?' And he wasn't," Bonnifield said. "He talked with us for quite a while on that subject. He weighed that decision to run for Congress very heavy. He loved the military, he loved the guard, he loved the soldiers he worked with." Walz said it was merely time to leave and he saw a chance to make a difference in the public policy arena. "Once you're in, it's hard to retire. Of my 40 years or 41 years, I had been in the military 24 of them. It was just what you did," he said. "So that transition period was just a challenge." Bonnifield and his brother did deploy to Iraq, in different units. And they both dealt with severe mental health issues upon their return. Bonnifield said Walz the congressman worked to connect struggling Guard members with help and sought to cut red tape. "If you listen to him, he's got a very loud, strong voice," Bonnifield said. "But there's a very caring person inside. And one very good leader, too." Minnesota's governor is also commander in chief of the state's 13,000-soldier National Guard. Guard units can be mobilized to respond to natural disasters and other domestic crises in addition to being activated and deployed into overseas conflict zones. Recently, governors from both parties have objected to their home-state Guard troops being pulled into service on the southwestern border as part of a crackdown on illegal border crossings. Minnesota's Guard wasn't among those tapped for that assignment. But here's how Democratic candidate Tim Walz and Republican candidate Jeff Johnson said they would respond. "I would not be comfortable having us be part of a mission that separates children from their families. That is a federal government role that needs to be carried out by civilian authorities in immigration control ... (The Guard) is not and should not be used as immigration control. That is an absolutely inappropriate and wrong mission. And I think as the chief executive of the state of Minnesota being able to reflect those concerns adequately with personnel who know this in the Pentagon, at Guard Bureau, is critically important." "I would likely authorize deployment for this purpose, but only after discussing the situation — and any question of parameters or restrictions — with officers in the National Guard."